Tasting Hawai'i With Moloka'i Chef James Temple: Stuck in a Eating Rut? Stuck in a Eating Rut? • Next time you go to the grocery store, look around for new products. Buy brown or wild rice instead of white, pita pockets instead of white bread, and pears instead of bananas. • Try one new food each week. • Go out for dinner and try something different on the menu. • Change your old standbys: dress up your sandwich with spinach leaves instead of lettuce, stir sliced veggies into your scrambled eggs, choose a new type of cheese for your casserole. Try cooking the same food in a different way, like instead of drowning everything in soy sauce, try a new seasoning. • Visit a farmers' market, and if you are not familiar with something, ask the vendor how to prepare it. That's where I found out about sweet potatoes leaves. • Have a potluck at home with a theme: German, Tex-Mex, Italian, Chinese, etc. • Take a cooking class, or watch the food channel on TV to get ideas. • Buy one of my cookbooks or get a subscription to a cooking magazine. And don't forget... "Variety is the Spice of Life!". There are many variations for this rustic Tuscan Italian bread salad, but basically the bread, tomatoes, and basil are the stars here. You'll need a good, dense loaf of bread that is at least a day old! Other options are to add capers, olives, roasted red bell peppers, mozzarella cheese, anchovies, etc. 8 thick slices of stale country style Italian bread, or French baguette, torn into bite-size pieces. 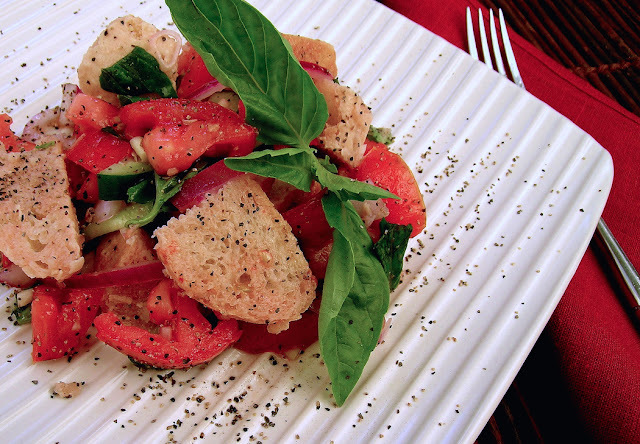 In a bowl, combine the tomatoes, cucumber, onion, garlic and basil. Drizzle with the 1/2 cup olive oil and the 2 tablespoons vinegar and lemon juice, season with salt and pepper and toss well. Place half of the bread in a wide, shallow bowl. Spoon half of the tomato mixture over the bread. Layer the remaining bread on top and then the remaining tomato mixture. Cover and refrigerate for at least one hour or until serving time. Just before serving, toss the salad and adjust the seasonings with salt and pepper. At this point the bread should have assorbed the juice from the tomatoes and be all moist. Serve immediately. Makes 4-6 servings. Loco Moco, "Local Kine Grindz"